I wanted to try sundal with Oats after some failed attempt I tried below one. It is steamed. It is definitely healthy alternate to the normal regular oats porridge. Grind the oats to a fine powder and mix with rice flour. Add salt and coconut gratings. Bring two cups of water to boil and add little by little to the flour and make a soft dough (like chapati dough). Make lemon size balls and keep it aside. Put a kadai on the stove and add oil. When it is hot, add mustard seeds. 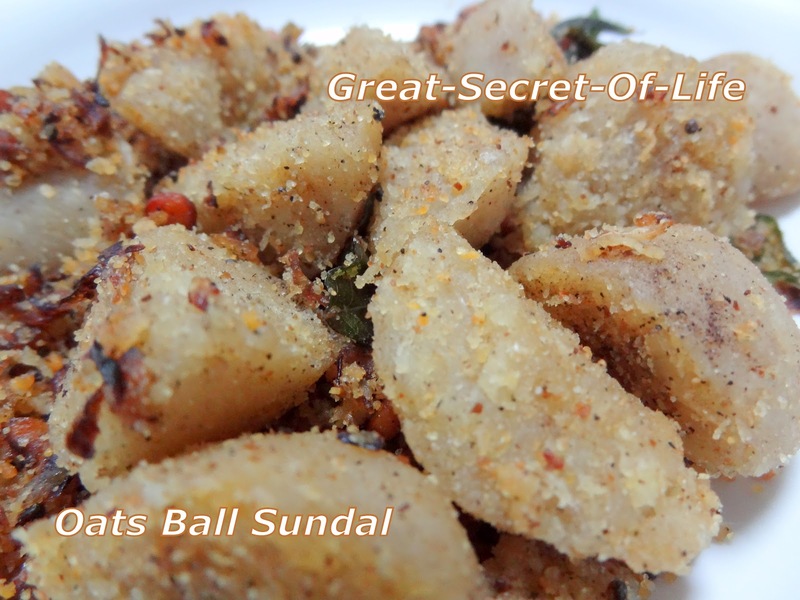 When it splutter up add bengal gram dhal, Curry Leaves and fry till it turns light brown. 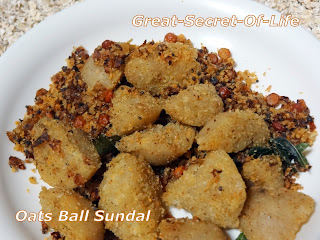 Add the cooked balls and sprinkle the pepper powder and Idli Milagai Podi and mix well. Remove from stove and serve as evening snack.